Rail World - Train Games - Play now free! Full steam ahead: Dive into the extraordinary game setting of Rail World. 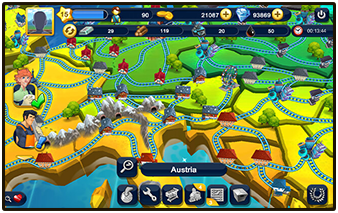 Establish your own railway empire, become a successful tycoon and lay tracks all over Europe. Expand your train fleet with steam, diesel and electric locomotives. Keep your fleet ready for action, transport goods and passengers, form partnerships with cities and establish new headquarters. Thrilling challenges and numerous customization options await your in Rail World. Complete exciting quests, unlock additional online features, and design your own railroad empire. Let yourself be captivated by the entertaining history, full of quirky twists. Play for free on your PC. The popular app is now available as a browser game! Discover the best train game for your browser – Rail World! Build your own railroad network where you want it. Create infrastructure between cities all over Europe, establish new bases and manage your own train station as a base of operations. Decorate the surrounds with trees, flowers and fancy lamp posts. Complete extraordinary quests, transport passengers and goods, increase your in-game revenue and reinvest in the expansion of your infrastructure. Acquire new trains for your fleet and show off your organizational skill. Manage your routes and meet a cast of quirky characters – from conductors over mechanics to signaling controllers. Get started now and experience Rail World online for free. All you need is a PC with a working internet connection. Let's go! The wait is finally over: The popular train game app Rail World is now finally available as a browser game! An ambitious entrepreneur, you'll begin with a rather humble train station, but it won't be long before you're laying tracks and building an empire. The further you progress, the more options will unfold before you. 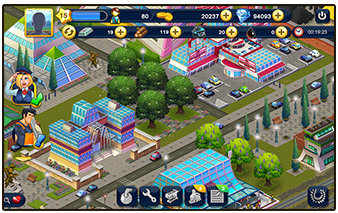 Discover a fascinating mix of business simulation and city building game. Meet quirky characters such as the charming conductress Carol, track layer Mike and Willy from signaling control. Expand your train station, decorate the surroundings and build numerous establishments, from restaurants to steelworks, to a private bank and lumber mill. Discover this extraordinary train game adventure. 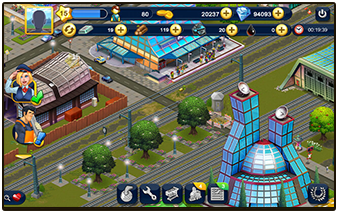 Just join the fun online and come a railway tycoon. You can play Rail World for free on any PC with a working internet connection. This Browser Game is off the Rails!